Having the right displays of garden furniture near Middlesbrough has made us one of the most sought after suppliers of outdoor furniture. The quality of the products we have in stock has led to this effect. There is also the fact that, although growing, our collection already has the furniture designs and items most popular in this part of the world. Visit our nursery and browse the displays to see what would look amazing in your garden. Our table and chair sets have become a cause of pride. Garden owners in and around Middlesbrough are loving the designs we have picked for our collection. We have compiled stocks of garden chairs near Middlesbrough for a wide range of users ― from a recliner and footstool for one person and a double seat with a table for two to picnic tables and chair sets for larger groups. Furthermore, our bistro sets are also causing quite a stir. Our benches near Middlesbrough are also catching a lot of attention of garden owners in the county. Benches allow two to three people to sit together without the fuss of a table. They require limited room and will go well in most parts of your garden. We have garden benches of both 4ft and 5ft in length, arbours with storage space, and also a quirky planter bench from Zest4Leisure. Since the sun is not always pleasant, we have parasols near Middlesbrough available in our stock of garden furniture. You can have afternoon tea in the garden without sitting in the glaring beams of sunlight. To keep your parasols steady, we have a number of designs available for their bases. 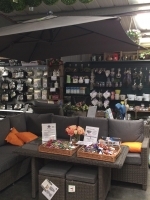 We also have a variety of garden cushions and furniture covers available in our garden centre near Middlesbrough to protect your benches, chairs, and cushions from the rain and elements. Our range of garden furniture may be growing but the quality of our products is bringing new and old customers to our garden centre in numbers. As with all our product categories, we make sure every product that we include in our outdoor furniture category comes from a reliable manufacturer that garden owners in Britain trust. So, when you buy from us, you know you are buying quality. For now, we are only using top-of-the-line quality of brands such as Bosmere, Briers Limited, Kettler Ltd, Lawson Donaldson LTD, Leisuregrow Products, Rondeau Leisure, Smart Solar, Stax, and Zest4Leisure. When you visit our nursery and furniture displays, do talk to the sales person serving you. They are trained professionals and can help you build remarkable combinations of items within your budget. Visit us soon and take home what you like among our garden furniture near Middlesbrough. Also, take a look at our well-priced garden tools!